Engaging young people in emerging actions sports like BMX, skateboarding and parkour was the driving force behind CSU Bachelor of Business Studies graduate Jemima Key establishing Big Air School. 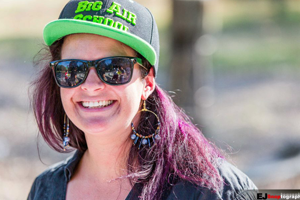 Big Air School sees a team of action sports athletes, DJs, youth engagement specialists and administration staff assisting local governments and youth service providers to engage young people through demonstrations, workshops, competitions and recreation programs in their local communities. The Big Air School crew has performed everywhere from Oodnadatta in Central Australia to Etihad Stadium in Melbourne. I chose CSU because...I wanted to go to a regional university and Bathurst offered the best range of courses in areas I was interested in. I started in advertising then went to agricultural business management, then marketing and finally business studies. Don’t judge me! My best experience at CSU...is impossible to define. I had such an amazing time there and met the best people on the planet. My worst experience at CSU...was when one of my besties had a car accident. He still needs full-time care. At university I was inspired...by the people around me. One of the best things about CSU is that many people have to move away from home to attend, so you’ve got a mix of people from different backgrounds that are brave enough to leave their comfort zone. I actually have a really strong business network from Uni days and we work together whenever we can. From Olympic athletes to TV personalities – there are so many high profile friends I have from CSU. I never dreamed I would...be finding so much joy in my work. I love it (most of the time) and I get a real kick out of having the freedom to dream up an idea, give it a go and hopefully earn some income. Beats the hell out of telemarketing! I’m most proud of...my business, Big Air School. It’s my greatest achievement. In a few short years we’ve been all over Australia from Coober Pedy to Etihad Stadium doing stunt shows and running workshops. It was just a crazy pipe dream that somehow became a reality. I’m also incredibly proud of my wonderful staff, who remain enthusiastic and cheerful no matter what obscure situations we end up in. Also, massive props to my 2IC Lyndon, who started as an intern from CSU and has now travelled all over Australia doing everything from event management, to driving buses, to DJ-ing, break dancing and standing in as sound technician for Justice Crew. I love...providing a service that sends the right messages about safety and active recreation in a cheerful, gravity defying, back-flipping way. Mostly I love that we make people happy, we aren’t changing the world but we are making people smile and hopefully providing inspiration to young people. In the future I’d like to have enough cash to do more sessions for kids in detention centres. We’ve done a few sessions in juvenile justice centres and immigration detention centres and they have been incredibly rewarding. The best piece of advice I ever received...was from my Dad. He said that if you are short on time and split between tasks, focus on the task that will matter more in five years time and do it properly. One last thing… force yourself into having a good work ethic. It makes work so much more enjoyable when you stop watching the clock and really care about what you do.